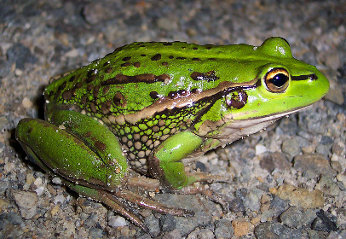 The Growling Grass Frog, one of the largest frog species in Australia, was previously widespread across Victoria. They were once so abundant In Victoria that they were used for dissections in universities and to feed the snakes at the Melbourne Zoo. The now endangered Growling Grass Frog were once so common around parts of Melbourne that they were the only frogs people saw. Worldwide, amphibian have declined and become extinct at a greater rate over the past fifty years than birds, reptiles and mammals. Australia alone has seen the extinction of eight frog species in recent decades. At least 27% of the 219 Australian frog species are threatened with extinction. Wildlife species cannot be “saved” in the long term by protecting them solely in captivity in zoos or small reserves. Without the existence of sustainable wild populations interacting with their environment, and evolving, each species will end up hopelessly inbred, and eventually doomed to extinction. Apart from high quality wetlands, they need grassland habitat for foraging, dispersal and shelter, and overwintering sites. An anthropocentric colonial concept assumes that "vacant" land is a wasted resource unless there is concrete, lawns, landfill, infrastructure and housing on it. The framework to protect our native species, even endangered ones, can easily be "revised" and made impotent against the lucrative economic momentum of the property development industry. The expansion of the urban boundary is not really urban planning but a caving into market forces and the greed for growth. Native species are victims of relentless government efforts to increase the size of our economy. However, each species, even humble native frogs, have intrinsic value and a role to play in maintaining our shared ecological foundation. Part of the problem of protecting Melbourne's "marvelous" status is that Melbourne's population continues to grow. Those governing and making decisions on planning assume the adage that "growth is good". Population growth has become a synonym for economic-growth. We are outstripping our ability to provide for the demands of our swelling population. This is a time of job losses, and a decline in our once vibrant manufacturing base. An economy that relies on housing inevitably comes hits the limits of growth with the inability of being able to fund infrastructure, especially for the outer growth suburbs. We are being strangled by an economy built for failure. The short-term benefits of land taxes, cash flows and stamp duty etc fail to cover the long term costs of urban expansion. The goal should be to grow the economy until the costs are higher than the benefits. At this stage we need wisdom, and the political willpower to stop growing. Our growth is now uneconomic, counterproductive and destructive. City planning has become synonymous to the greed for growth at all costs. Protections for key threatened species in areas added to Victoria's urban growth boundaries by the Baillieu government have been wound back under yet to be released biodiversity plans. Under the revised plans — which still need approval by the Commonwealth — proposals for wildlife corridors for rare bandicoots have been scrapped and buffer zones for threatened frogs reduced. 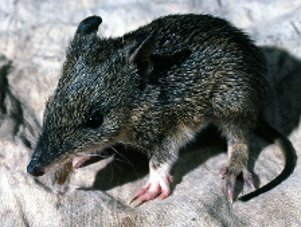 The Southern Brown Bandicoot, which is listed as threatened in Victoria, would have set up corridors for the species to move between habitats in Melbourne's south-east, will be re-written by the end of the year – no doubt watered-down to make more ease for developers. Southeast Melbourne and the Westernport region are home to some of the few remaining populations of Victoria's endangered Southern Brown Bandicoots outside of national parks. The proposed buffer zones around waterways and wetlands to protect the Growling Frog populations will also be reassessed and weakened. It's an effort to make green wedges and conservation corridors more rubbery and eventually non-existent. According to the VPNA media release 12 June, Obviously the Victorian Government has been captured by developers and is failing to take into account long-term conservation and community needs. On 16 April 2010, the federal environment minister approved several prescriptions for ecological communities and threatened species associated with the Melbourne strategic assessment. These prescriptions specify requirements for protection of nationally protected matters that must be followed in preparing precinct structure plans and in undertaking individual developments. The expansion of Melbourne's urban growth boundary will also include the clearing of critically endangered grassland and woodlands, as well as the establishment of large grassland reserves west of the city and 200m wildlife corridors on each side of creeks. 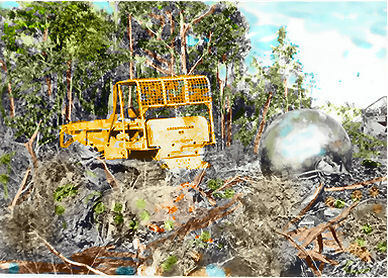 Our slow-evolving species need to adapt to more disturbances, smaller fragments, narrower gene pools and thinner remnant habitats - what the developers and our State government condescends to “save” for them. Southern Brown Bandicoots once occurred commonly in the wider Frankston area (pre-1970s). They have rapidly declined and are now restricted to isolated remnant habitat patches. Presently there are only two known populations within 15 km of the Pines Flora Fauna Reserve, namely the Royal Botanic Gardens Cranbourne (RBGC) and at Quail Island in Western Port Bay. The population at RBGC is the only population in the greater Melbourne area large enough and managed appropriately to be considered secure. It's the thin-edge of the knife! Nationally threatened species such as the Southern Brown Bandicoot, Growling Grass Frog and the critically endangered Golden Sun Moth should be protected before final urban growth plans are released. But this hasn't happened as yet! Instead of green landscapes and green policies, they are being based on greed. Peninsula Link's builders are spending $20 million on eco-friendly initiatives including a "furry freeway" for endangered wildlife. A 30m-wide underpass will allow animals including the protected southern brown bandicoot to cross below the freeway. Picketers were attempting to save native bushland from being cleared until the appeal was heard and were keeping a 24-hour vigil at the Frankston South Westerfield property, a pristine pre-settlement biodiversity hot-spot. 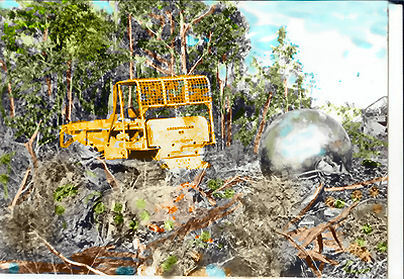 Bulldozers razed the area anyway, and the “furry freeway” for endangered wildlife is simply tokenism. Property prices in the Peninsula are expected to surge. Coalition co-ordinator Rosemary West said the inclusion of a Cranbourne South egg farm within the urban growth area could rebound on the government at the next election. Planning Minister Matthew Guy announced the decision to rezone the 104-hectare Brompton Lodge egg farm in June this year following a logical inclusions review. The review committee concluded it was not high-quality agricultural land and the egg farm was not viable in the long term. What is “viable in the long term” now? Nothing in the way of “progress” and urban sprawl! It also recommended incorporating the adjoining Ranfurlie Golf Course within the urban growth area. Coalition co-ordinator Rosemary West said the rezoning was very poor planning, with Brompton Lodge surrounded by green wedge on two of three sides. It's beautiful land, it's in the path of a proposed southern brown bandicoot corridor between the Royal Botanic Gardens at Cranbourne and The Pines Flora and Fauna Reserve in Frankston North , and it's a viable egg farm. It's doomed to yield 1100 housing lots! Native animals, conservation corridors, food production, green wedges and picturesque land and our city's “lungs” can't hold back the spread of concrete, housing and the lucrative profits from population growth. Federal Environment Minister Tony Burke will have to give environmental approval before the growth plans can proceed. However, with State government having control over biodiversity and with no population policy coming from Burke, also the Minister of Sustainable Population, there is little chance the answer will be “no”! Comment removed - Contributors and editors, please take note. Editor: We have commented out the comment previously here, entitled, "I wish ethnics were endangered," because it conveyed a double entendre identifying debris at sea with asylum seekers. The main problems were that it also implied that asylum seekers are people of undesirable ethnic origin and that it showed a lack of compassion for people lost at sea and a prejudicial attitude implying that all asylum-seekers have bogus claims. In a way it as quite clever, since shipwrecks, whether accidental or intended, do cause debris to gather in the ocean. So does disposal of rubbish overboard from any boat, not to mention what washes down our drains, without going into the massive injections of rubbish into the sea by tsunamis, notably the recent Japanese one. The comment went on to conflate debris in the water with overpopulation on land. It also implied that asylum seekers were given special treatment at the expense of Australian taxpayers but that caring for the impact of humans on the sea was neglected. It suggested that asylum seekers got Club Med lurks and perks. It did not say explicitly what it meant by that - whether it was referring to the expenses involved in looking after asylum seekers whilst their claims were heard or whether it meant the expenses involved in sea-rescue and subsequent emergency accommodation. It expressed a desire for 'ethnics' to be 'endangered'. This was another multiple entendre since 'endangered' can mean both rare and vulnerable as in species with declining numbers, but it also evokes a wish for 'ethnics' to meet with violence or for the numbers of asylum seekers to drop. The comment also has a go at Prime Minister Julia Gillard by linking her foreign birth with an inferred preference for foreigners over Australian born people. It then talks about a game played by Australians of 'spotting the Aussie' when going through Richmond, presumably because in this Victorian suburb some streets sometimes appear dominated by Vietnamese immigrants. The implication is that the bulk of Australian-born are European-looking whilst in Richmond the balance is changing to a less 'Australian' one. The comment then switches the Aussie descriptor to indigenous growling frogs vs imported canetoads and talks about eradication. It also goes from shipwreck debris to 'asylum filth', a term which seems greviously insulting to all asylum seekers. A partial defense might be that a recent 4Corners documentary exposed a greedy criminal trade working under the cover of transporting asylum seekers in some cases. Note that the regular legal immigration stream to Australia absolutely dwarfs the small number of asylum seekers coming to Australia each year, so, numbers-wise, the comment also lacks validity. It might have had some exiguous validity if it had talked about reasons to fear that numbers of asylum seekers could significantly increase, but it does not do that. In sum, there are enough violent and threatening references and insulting and hateful metaphors to make this comment, which we have commented out, unpublishable. Not only is it unpublishable, but we have felt constrained to explicate it and apologise for its publication, which seems to have gone through without sufficient vigilance. Contributors and editors, please take note. The loss of animal species in and around expanding Melbourne is an absolute tragedy and this heritage as well as the lives of those creatures are being taken without any consultation through government polices of growth predicated on population growth at any cost. The issue of asylum seekers in this context though is a complete distraction as is the issue of anyone's ethnicity . To speak of "ethnics" as though this were a real category of people ignores the fact that everyone has an ethnic background , however mixed, obscured and lost in the distant past. It is a mistake to select the most vulnerable as the scapegoats. The real culprits are actually in power or have undue influence on those in power. Ed. The above quote has been edited out pending review of its impact and a representation that may highlight its purpose and situate it in historical context. Please do not repost it before this is acheived. Who are the real parasites? I was certainly not trying to minimise , negate or deny the stuff that many of the early immigrants to Australia were made of. I am one of their descendants and quite proud to be so. Like nearly 2 million other Australians I claim Irish ancestry. That is part of my ethnicity but I am foremost an Australian having been born in Australia and through direct experience formed a strong attachment to its land, its birds and animals when I was very young. I feel as Australian as the dingo - but cannot perhaps claim to be as Australian as the blue tongued lizard. The real culprits in eroding Australia's sovereignty, its national identity (except multiculturalism) are those who give voice to propaganda that would make Australians believe that they have no culture and therefore no rights to call their country their own and those who care only about thrashing the country to death with overpopulation through mass immigration for their own short term gains. These are the real parasites. The first victims of this are our fauna and flora but we can't be far behind. And so my 'Ode to Australian Ethnicity' comment has been withdrawn from publication by CanDoBetter uber-righteous police. The Ode was quoted untampered from Australia's most celebrated poet, Henry Lawson. No person was directly vilified, no specific ethnic group was vilified. How different is it to Christian Church Bells are being withdrawn from Christian societies and schools? It is so as not to upset the new non-Christian minorities usurping their foreign cultural roots. In the old days, no one would give a flipping toss. Australian schools now ban church bells because those who associate church bells with Christianity who are not Christian scream 'racism'. "RE: Comment removed - Contributors and editors, please take note. Editor: We have commented out the comment previously here, entitled, "I wish ethnics were endangered," because it conveyed a double entendre identifying debris at sea with asylum seekers. The main problems were that it also implied that asylum seekers are people of undesirable ethnic origin and that it showed a lack of compassion for people lost at sea and a prejudicial attitude implying that all asylum-seekers have bogus claims." Racism plays directly into the hands of those driving the Big Australia agenda. It's easy to marginalise opposition if it can be presented as fringe dwelling racists and weirdos. I've seen activist campaigns ruined because agent provocateurs have pushed activists toward, or presented, extreme positions that alienate the general public. The media zeros in on the ugliest and most extreme examples in any social movement. They don't have to infer untenable political positions if extremists do it for them. I'm opposed to Big Australia for a wide variety of reasons but none of them are based on racist views. Most people I know who oppose Big Australia feel the same way. Some of the racist comments are just pathetic. If you want to cater to that agenda you will quickly shrivel on the vine and the low lifes will crawl back under their rocks waiting, like ticks, for a new host to parasitise. You need to decide whether you want to be relevant or not. At the moment it looks like you're trying to become the environmental wing of the White Pride movement. That's a one way ticket to political irrelevance and oblivion. I come here to catch up on environmental campaigns and to follow the fight against Big Australia not to read the rantings of closet racists. I think you'll lose far more people than you can gain if you take this path. But I might be wrong, resistance to Big Australia might only ever be the preserve of a minority of committed, fringe dwelling racists. This is a response to "Racism helps the Big Australia agenda". Thank you for your comment. It is very welcome. The editors share your concern about a some recent comments. Our policy is that we don't publish anything that is illegal and racism or incitement to hatred is illegal. (See Racial Vilification Law in Australia below this comment). By the same token, the owner of the site, James Sinnamon, is against censorship of anything not illegal. He feels that all points of view need to be known and published and that others should be able to argue against them also without fear of censorship. Candobetter is a politics and environment site and its quarrel against Big Australia is the impact of numbers on democracy, land-tenure, environment, and scarce resources. We only have a few editors and sometimes things get missed. We will review comments today and tomorrow. Please let us know of any specific comments or articles that you object to. We will also talk with our regular contributors about this matter. The reason that some comments that are not explicitly racist but nonetheless show that the authors are concerned about social changes rather than environmental changes induced by big population goals are published at candobetter is because of our policy of total non-censorship. Maybe we need to more clearly state that our opposition to racism somewhere here and exercise stricter requirements for arguments in this. The mainstream press is filled with allegations that Australians are racists and we don't believe that most of them are. What comes out sometimes in these pages, with, for instance, Australia First comments, is that some Australians are seriously upset about changes to ethnic composition in Australia. That is arguably a symptom of the impact of big numbers and a reality that may be better served by looking at why it arises in this form, where resentments against government and corporate induced high numbers are personalised against specific groups. Your comment, however, that racism serves the cause of Big Australia is absolutely right. A variety of acts can constitute racial hatred, including speaking, singing and making gestures in public, as well as drawings, images, and written publications such as newspapers, leaflets and websites. 3) It must be done because of the race, colour or national or ethnic origin of the group against whom it is directed. These elements are considered individually below. It should be noted that some public acts are exempt from the provisions. The exemptions are outlined later in this section." The Racial Discrimination Act makes it unlawful to insult, humiliate, offend or intimidate another person or group in public on the basis of their race. I don't think that anyone who has comments published on cdb is guilty of racism under these laws. If we become hyper sensitive or too politically correct, then we lose our freedom of speech. Our population growth is largely from Asia, and while we all agree that "big Australia" needs to be re-thought on environmental, economic, social, ecological and food-security grounds, the fact that most of our immigration is from Asia should not thwart our objectives. It's not about racism - or the belief that there are superior and inferior ethnic groups. The meaning of the word "racism" has undergone a radical change to mean anyone who criticises immigration or ethnic demographic changes. Changes are not always "better" or desirable. Nobody is vilifying a particular race, nation, ethnic group, or religion. However, there are some immigrants who don't come from democratic and open societies, who come with cultural baggage that's largely incompatible with the Australian way of life - something that is part of our heritage and needs to be preserved. Anyone welcomed to Australia should be free to keep their culture, traditions and languages alive within their homes and communities, and add to the vibrancy of our cities, but they should first and foremost appreciate Australian history, environment, natural heritage and "fit in" to our lifestyles and values. "1) The act must be done in public". I think it then applies to published comments on a blog. Comments are public. With due respect for what you put forward here, might I add that there are also ways of criticising 'cultural baggage' that are safer than others. Personally I would say that Australia is in great need of a code of civil rights because, at the moment, the 'traditions' and 'values' many claim as Australian have no legal defense as rights. The claim that Australia is an open and democratic society is a belief. It does not stand up at law. We have no legal rights to free speech or free association. We have precious few rights. We need rights. If we had rights under a civil code, it would be much harder for them to be endangered by any 'cultural baggage' - that of Australian-born or that of immigrants. Greens candidate Cathy Oke, 37, environmental education consultant, Melbourne City councillor since 2008. She says : "I think we can maintain population growth within the city of Melbourne as long as we’re investing in schools, childcare, sustainable buildings and the like". Population blindness must be in epidemic proportions. She sees "planning" and "infrastructure" the solution to conserving living standards. She says ..."that we’re not investing in community infrastructure, nor investing in proper transport links to grow the cities of the future". As an environmental educator, surely she knows that anthropogenic climate change can't be addressed while we are growing our economy through population growth? People living in high rise apartments emit higher greenhouse gases per capita than those in detached family houses with trees and gardens, and are captive to inside utilities and power. The Greens together with the Lab/Lib are all pushing rapid population growth, which is killing Melbourne in every way. It's seems there's a fear of "stagnation" unless there's big growth. Melbourne's population could outstrip Sydney's and reach 6.57 million by 2041, according to one ABS estimate based on higher national fertility and immigration rates. It's inconsistent with their open-border asylum-seekers rights. With decades to wait on public housing, asylum seekers would just bolster the queue even further. Population growth is outstripping funds for infrastructure, and that's why there's "shortages". "In North Melbourne, council and the community have worked over many years planning for population growth and density growth and they want to see that plan enacted," she said. Really? Population density does not prevent the threatening process of urban sprawl. Families eventually expect to live in a family-friendly house, with garden and space for children. How can the threats to already endangered species by willingly justified on economic grounds? It's easier to go-with-the-flow than ruffle the feathers of the powerful growth-lobby. They support protection of people in preference to protection of the environment and refuse to admit that you can't do both. You have to chose between a growing population and the environment as they're mutually exclusive. A person or a party may call themselves "Green" or an "Environmentalist" but they may mean something entirely different from those terms than you or I do. Or they may just be trading under those terms, for more or less fraudulent purposes. Children should learn in school and we should all be aware that just because you say you are Green does not mean that you are. Similarly, what has happened to the Labor Party? Since when did the property developers infiltrate them? Are there any real 'Labor' people left? And, if the Liberal Party was once formed to represent small business people, they don't appear to give a stuff about them any more. Like Libs and Labor, it is all property development and big business. Same goes, it seems, for most Greens. The citizen is getting a raw deal out of this. But then we don't have any citizens' rights worth speaking about. We need a code of Citizens' Rights! Many who add to population growth not "yellow" or "brown"
Thanks for your reply, Sheila. I too have grave reservations about any form of censorship but in the context of this issue it is weighed against innocent people being victimised on the basis of nothing other than their ethnicity. I want to see our population stabilised but don't advocate "sending people home" or victimising them for coming here. I don't want to see people being abused and assaulted in the street because their ethnicity profiles them as being responsible for Big Australia. The fact is that you won't even notice many of the people who are adding to our population growth because they're not "yellow" or "brown". I want to see that mythical "egalitarian" Aussie spirit extended to everyone wanting a better life regardless of their race or socio-economic status. We're all here now so let's work on undermining the political and economic forces that steamroll and exploit the many for the benefit of the few. How about people look at the real issues? Like this piece of mindless and errant propaganda in the corporate media that gives Big Australia a free kick... If our population doesn't grow, the economy stalls of 16 July by Matthew Kidman in the Age... (?) ... would rather focus their dissatisfaction on the most powerless elements of the growth agenda. I found your posts offensive John and I'm hardly a "foreign usurper". I'm 5th generation Australian. My father was born early last century so we go back a fair way in this land. I might not be indigenous (as far as I know) but I'm hardly a Johnny-Come-Lately. I also struggle to relate to your concept of "Australian rights, larrikin myrth and rebellious spirit". English, Irish and Scots in Australia's early days were like chalk and cheese. Most of my bloodline is connected to English Imperialism stealing my ancestral land, destroying the culture and generally committing genocide. My ancestors were refugees, they weren't privileged English elites, capitalists or royalty. They're the people who subverted the dominant English paradigm. The qualities you mythologise and praise arose from people who were forced into emigration. They were boat people. Big Australia is the love child of English imperialism. Can you see the parallels? The racial differentiation has pretty much gone these days (with a few pathetic exceptions) but the exploitative mission of the people movers is the same. My kids attend a public school. I barely managed to escape the demented world of Catholicism unscathed (arguable) and I wanted my kids to have a non-sectarian education. It's bad enough seeing facilities over-crowded and run down without happy clappers trying to indoctrinate them. I look at the kids at this school and it is as racially diverse as you'd find. To think people would use these kids to make a political point makes me livid. Every one of them has right to a decent life and their parents are to be commended for trying to offer their kids a better life. The idea that they are undermining some kind of racial or cultural purity in Australia is laughable. We're a nation of mongrels and we have been ever since we stole this land from Aborigines. Superficially I might pass your test of racial purity but I see myself as Celtic not Aryan, and your rose tinted historical view of English Imperialism is as repulsive to me as is Nazism. This is about neo-liberal imperialism and ideology, not race. I'll fight Big Australia but I've got no time for racists. To all those self-righteous 1st, 2nd, 3rd, 4th, 5th, 6th, 7th, 8th generation Australians, did any of their ancestors ask the first Australians for permission to colonise and imperialise? Many of their descendants justify that their poor colonial ancestors had no choice, were poor, were convicts, were transported here. Well my own familiy 'arrived' here in the 1830s, and I am 7th generation. Does that mean I have claim to bump off all 6th generations and subsequent arrivals? No but possession is a right and for the reconciliation process needs to start with those here first. But as more 'arrive' and displace the incumbents, such a task becomes more complex and less feasible. To the first Australians were not all since 1788 clearly invading usurpers? Not even a Maori Treaty like in NZ; but just possies of slaughter, genocide and disease, followed up with displacement, mission stations and alcoholism. We can't change history, but we should learn from it or are destined to repeat it. The current immigration illegal or otherwise is a discretionary choice of current government, like Gillard's discretionary $1 billion to Afghanistan last week and just like $50,000 to upgrade a muslim mosque on Christmas Island to accommodate the needs of the arriving 'clients'. Gillard bends over backwards to care for foreign refugees, while ignoring Australia's internal refugees - our growing underclass. 'Racist' - now there is a convenient slur for anyone to put down local dissent. A racist is anyone that is prejudiced against a particular race. Given Gillard's prejudice toward foreign refugees and ignoring of Australia's internal refugees, there is one clear example. If you want to experience real racism, go to any of the countries where the asylum seekers are fleeing. Most flee civil war and where there is civil war, racism has manifested into ethnic cleansing. But the racist slur is pompously brandished by foreigners who seek to not just arrive and respectfully assimilate, but those who seek to ursurp - bringing and imposing their cultural baggage upon the incumbent population. The do gooders celebrate 'diversity' without reconciling irreconcilable differences in culture. So christian church bells are banned from schools so as not to displease the new muslims. The newcomers brandish it religious discrimination. I have no time for racists or anyone who seeks to impose their foreign ways on local peoples - Australia or anywhere else. Anyone who thinks of themsevles as a mongrel, they have lost self-respect and a sense of national place. It is an anti-Australian propaganda embellished by those who idealistically wish for a no borders One World, who are naive to the consequences. Those following the Greens One Worldist messiah Sarah Flood-Gate Young are dangerously undoing Australian values. Not only is Rudd's Big Australia being perpetuated under Green Foreign Labor dogma, but the imported extreme cultures (Sharia, Buddhist, Muslim, non English speaking, unskilled, patriarchal sexist traditions) - all anathema to our prevailing majority social values generally accepted as being 'Australian'. Instead, foreign unAustralian values are being encouraged by the likes of Green Foreign Labor to flourish and even snub Australian dominant 'christian', 'democratic', 'western' culture. Australia's population growth is dominated by the immigrants arriving and intra-breeding. Once their numbers gain critical mass, Traditional Australians, just like the displaced Aborigines, will steadily become the marginalised minority beholden to the new majority. I find illegals offensive and the Gillard Labor Government's welcoming accommodation of them to be a breach of social contract and social betrayal. Worse are the 99% arriving by plane and ursurping their place taking over local housing, jobs, childcare and school places. Why is it that Australian capital cities are under extreme congestion stress? What is the real cause of the problem? It's interesting to see where the original comment under this article has taken the succeeding comments. Hardly any of them again refer to biodiversity loss. A perfect example of a distraction from what really threatens our living environment? Melbourne has to accommodate about 60,000 extra people each year. This increase in population is what underlies the destruction of farm land , bush land, and suburban environments. So while trees are cut down and gardens demolished to increase density in our suburbs and the available land decreases through population pressure, the City of Melbourne embarks on an urban forest strategy which includes rooftop gardens. I'm sure the possums won't mind taking the elevator up and down to whichever lofty gardens the choose to call home. 5. More demand for natural resources such as land (leads to deforestation displaced for more housing), more demaind for timber (from forest plantations and native forests) , energy (mining coal, coal seem gas), water (Desal plants), sewerage, pollution, CO2 emissions, environmental impacts, etc, etc. 8. The growth of humans "expands the urban boundary"
9. Wetlands are treated as wastelands ready for reclaiming for housing sprawl (move on Growling Grass Frog) - Article: "an anthropocentric colonial concept assumes that "vacant" land is a wasted resource unless there is concrete, lawns, landfill, infrastructure and housing on it." 10. "The framework to protect our native species, even endangered ones, can easily be "revised" and made impotent against the lucrative economic momentum of the property development industry." 12. Australia boasting the label 'a nation of immigrants' simultaneously boasts the highest rate of mammalian extinctions on the planet. Some proud reason to be a nation of immigrants. The Aborigines at least are not at risk of extinction. But Growling Grass Frogs have a good reason to be pissed off and 'speciesist' - worse than racist. Australia's biodiversity saving solution is not the Liberal's 'Stopping the Boats', nor Labor's Malaysia Solution, nor The Greens Open Door Solution, it is Australia First's 'End Immigration Solution'. I think we can be anti-immigration and anti big population growth without being anti-migrant. They are invited here by our governments and end up in far-flung urban sprawl or living in expensive apartments, with a promise of jobs, skills shortages, education and a better life. They are being deceived too. Sourcing immigrants from developing nations means there are less expectations of living standards, non-union workers, easily exploitable employees and compliant to the status quo. It's not their fault that they are being sold a "lemon"! Costs of housing are the highest in the world, and cost of "luxuries" such as water, and power, and increasingly beyond normal pay packets. It's a Ponzi-economic scheme that exploits economic unit - people! We can't assume that migrants want continued population growth! There are some that have come here to live in a "lucky country" but find the same pressures on them that they left their original homelands for. The Greens without a comprehensive and vague population policy are missing the target and thus failing to gain voter confidence. Green is not necessarily "green". They think that by recycling, re-using resources, renewable energy and planting roof gardens is the solution to the negative environmental impacts of population growth. The loss of already endangered Growling grass frogs and bandicoots that were once common will be inevitable by continued urban sprawl. The "revision" of protection laws is just weakening them down so they are expected to live in smaller, fragmented and compromised habitats while humans can expand their economic power and numbers. It's nasty, deliberate and avoidable annihilation based on predatory greed and rapacious appetite for growth and profits - with little concern for the outcome. Warren Hern, the Boulder abortion doctor, believes humans "have become a pathological process — a malignancy — in the planetary ecosystem" and that "if you like what the 20th century brought us in terms of war, famine, pestilence, and ecological destruction, you will love the rest of this one. It will be worse." Hern deplores the fact that global population reached 7 billion last October and opines, "At this rate, we will reach about 13 billion by 2050 and 25 billion by the end of this century..". He suggest humans — this "malignancy," — will outstrip resources and food supplies when our species' expansion in the past two centuries and especially the past 30 years, even though it has coincided with economic growth and increased health. At what cost to the planet's co-inhabitants? The deliberate extermination of native animals is a malignancy too! I am writing this in haste as a comment, although I would rather write a thoughtful article. I agree that Australians have a right to be recognised as a nation of people with a vital interest in and love for their land (whatever their origins). We are being deprived of our rights to self government in this land by the insertion of whole new communities that have been taught by immigration agents and statements from heads of government not to respect those already here. They are taught that the incumbents 'don't want to work', are racist and that this is a big empty country. (This is pretty much what colonial British were taught about the peoples of India and Africa. The ideology of working for a master is deeply entrenched in the culture of power here.) These false truths then justify the taking over of more and more aspects of our economy. We have no code of civil rights to protect us from these manipulations. But who is to blame? A colonial government aligned with corporate interests that is using immigration to prevent Australians from organising their own lives and economy. They behave as the British colonials did towards the peoples of India. By inserting their own people, they prevented self-government there and by rewriting land-tenure and inheritance laws they dispossessed long stable communities into beggary and overpopulation. The same thing is happening here. Whilst I can understand your rage about what is happening to our land and our rights, it seems to me counterproductive to personalise it against the immigrants or refugees, although it is okay to be furious about the numbers. We need to send out a concerted message that the government and the press and the migration agents etc are misrepresenting the rest of us and this country. Note, I am not saying that high immigration is not a big part of the problem. I am not saying that it is not vital to get control over the flow of asylum seekers. We take a big risk with our own insecure rights here however if we don't ensure respectful treatment and a reasonable variety of humane solutions for temporary stays, settlement, resettlement or repatriation, etc. I am saying that the enemy is the growth lobby and the growth lobby has got us and the incoming migrants (refugees and business) into a big mess that we have to get out of together somehow. We need new Australians to be our allies. We need to educate them to what is really happening. Rather than rail against the different beliefs and values of certain immigrant streams, why not spend our energies on demanding, writing and creating a code of civil rights which we then can defend. At the moment we have almost no legal rights in this country. When we talk about Australian values we might as well be carving butter, because they have no legal status. Let us identify them and build a code of civil rights for Australians. With regard to mosques: The treatment should be the same as for churches. One place to start would be that religion should be separate from state. Therefore no state leader should endorse any particular religion. Religious monuments and meeting places should be funded by members of that religion. Civil Rights or Australian Values? The topic is important enough to breakaway from this biodiversity issue, though respectfully critical as it is; but to explore and debate the root causes of the adverse impacts of human overpopulation on Australian ecology. Australia is not unique, but is part of the same global human migration and overbreeding problem. Immigration just facilitates the movement of people, it does not solve the people overpopulation problem. It just moves the problem from one place to another - due to push factors such as civil war and due to pull factors such as Australia's global image of wealth and fortune - which Wayne Swan constantly trumpets, especially overseas it seems. But your term 'Civil Rights' sounds American, and I am not familar with it and to how it may play out in the Australian context. Australians should not follow Americanism, but Australianism. So define it and explain it please - it deserves an article and I will be keen to contribute. But, I propose starting at a much deeper socio-psychological level - at 'values', then from there 'attitudes' and then 'behaviours'. What is Australian? What are Australian 'values', 'attitudes' and 'behaviours'. (Hopefully, not what we saw on Channel 10's 'The Shire' last night). Then within that context, what rights do locals have. Who are 'locals'? What rights do foreigners have? When do 'foreigners' become 'locals' and do they automatically have a right equal to locals or do that have to comply with some social mores? Go to an Arab the nation and discover if you have to comply with the local mores. Australia should not be so politically correct and seek the apex of moral high ground. The whole thing must work in the rough and tumble of Australian society, else it is all focus group utopianism that will only fuel ethnic tensions, xenopohobia and then outright racist violence. Let's not go there! There is nothing wrong with such a debate. It is mature. But please let leave the prejudice aside. At no time have I vilified any race. I don't care if people are green with pink spots. What I care most about is when the incumbent people are usurped by foreigners. I suggest a good historical tale is one of the infamous Highland Clearances of Scotland of the 18th Century. Read background. When you read it, compare it to Australia in 1788 and then now. It is a real wake up to passive compacent descendents of colonists. Now I could have Uzbekistan ancestry but I don't, but it doesn't matter. The issue is one of universal principle. If you can conceive a principle of justice workable ands respectful to both locals and foreigners, then it has to be universally applicable. I just happen to have Scottish ancestry, but I regard myself as Australian, not a hair mongrel! I have been to Scotland but I yearn setting fooit back in Australia, my home. Anyone who commits when they are honoured with Australian citizenship should feel an Australian passion - that may take time and they can be tuti-fruity for all I care. But if they are here to usurp, then they are not welcome in Australia. This is a vital debate for all nations, but unfortunately missing from the mainstream media, scared and too immature to touch it. Thank you for persisting. I feel I was misinterpreted before. No, not American. And not civic; Civil. My reference to a civil code is a reference to Roman Law as revamped by Napoleon in the early 19th Century. Almost all of Europe, even the countries he did not rule, eventually took it up because it works so well. The Germanic and Nordic countries were slower to do so because they had never been under the Roman Empire so did not have that basic identification with Roman law. Britain and, I think, Portugal (which came under British influence, unfortunately) also did not take it up and these countries have similar problems of poor democracy and huge inequalities and poverty. Basically there are two major kinds of legal systems in the European world including among ex-European colonies: Roman and British and they have completely different origins and effects. Where do Australian values fit in here? Well, once you have identified them, you need to create laws to enshrine and defend them. Examples of important laws are your rights to inherit from your parents vs your parents' rights to leave their assets to whomever. Another important right might be equality of sexes. Another one might be the right to cheap housing. Another one might be the right to an income. Another one might be the right to get out of a commercial agreement that is manifestly unfair. Think of some others. What would you like? Basically a civil code is a code of rights for citizens that can be enforced at law. The European Civil Codes are comprehensive and constantly reviewed. They are products of the French Revolution (which lasted several generations and post-dated Napoleon's reign). I know a lot about the antique and modern origins of this code and the differences between Roman and British law. These different law systems have huge impacts on whether or not property gets divided up and becomes concentrated in private or public hands. The British system is the bad one that causes overpopulation. The Roman system is much better. Of course most English speakers don't have any idea of the differences and assume what they have been told that the English legal system is the best is true. Napoleon in later life considered the Civil Code to be the most significant of his achievements. The Code represented a comprehensive reformation and codification of the French civil laws. Under the ancien regime more than 400 codes of laws were in place in various parts of France, with common law predominating in the north and Roman law in the south. The Revolution overturned many of these laws. In addition, the revolutionary governments had enacted more than 14,000 pieces of legislation. Five attempts were made to codify the new laws of France during the periods of the National Convention and the Directory. Through the efforts of Napoleon the drafting the new Civil Code in an expert commission, in which Jean-Etienne-Marie Portalis took a leading role, took place in the second half of 1801. Napoleon attended in person 36 of the commission's 87 meetings. Although the draft was completed at the end of 1801, the Code was not published until 21 March 1804. The Civil Code represents a typically Napoleonic mix of liberalism and conservatism, although most of the basic revolutionary gains - equality before the law, freedom of religion and the abolition of feudalism - were consolidated within its laws. Property rights, including the rights of the purchasers of the biens nationaux were made absolute. The Code also reinforced patriarchal power by making the husband the ruler of the household. The Napoleonic Code was to be promulgated, with modifications, throughout the Empire. The Civil Code was followed by a Code of Civil Procedure in 1806, a Commercial Code in 1807, a Criminal Code and Code of Criminal Procedure in 1808 and a Penal Code in 1810. A Rural Code was debated, but never promulgated. The Code Napoleon, renamed the Civil Code, was retained in its majority after the restoration of the Bourbons in 1815. The Civil Code has served as the model for the codes of law of more than twenty nations throughout the world." Go to the link to see the subjects covered under the code. These codes are continuously revised but continue to be based on the first French publication of 1804. The boats won't stop - so what should we do? Very few people picked up on the point the author makes about the huge numbers arriving via the migration program compared to the humanitarian intake. Everyone seems obsessed with a sad little flotilla of "boats" while an A380's worth of permanent residents arrives daily and appears to land in a mental blind spot. If we have around 50,000 - 70,000 immigration places available each year, assuming that number would see us stabilise our population, I'd prefer give those places to those in need. I'm less magnanimous toward the global plague of upwardly mobile, aspirational, middle class locusts who descend on greenfields to devour all before them. I suspect they are driven by a futile quest to satisfy with worldly goods a spiritual void that cannot be fulfilled materially. Perhaps I should pity them too and show mercy? What's the point of rejecting one form of prejudice and replacing it with another? I'm probably similar to you John in some respects but our biases are in different realms. I'm sure my hierarchy or "worthiness" could be criticised as "classist". I'll wear that. Class War seems to have a more coherent and logical philosophical basis than Race War. In the end, aren't we trying to save the Earth from mindless consumption. And isn't mindless consumption a function of Western class and economic structures? I saw a report on an interesting statistic fished from the last census. 17,500 Australians earn in excess of $650,000 pa (forget "the 1%" meme of the 'occupy movement', we're talking about "the less than 0.01%"). While I have no evidence my intuition tells me these elites are the architects and beneficiaries of Big Australia while the rest of us get a smaller share of the pie and see nature and our built environs suffer under the weight of numbers. During the Russian Revolution the workers only left the factories to protest when, after years of brutal deprivations, their rations were cut from a loaf of bread to half a loaf of bread. How difficult will it be to snap people out of their Bread and Circuses complacency and challenge Big Australia's massive propaganda machine? The Law of Mother Earth recognises the rights of all living things, giving the natural world equal status to human beings. At its heart is an understanding that the Earth is sacred, which arises from the indigenous Andean worldview of ‘Pachamama’ (meaning Mother Earth) as a living being. In 2008, Ecuador took the bold step of adding Rights for Nature to their new constitution. The Rights for Nature Articles provide a system of environmental protection based on rights. Historically, like in the US and most world countries, Ecuadorian law treated ecosystems and natural communities as articles of property which gives land owners the right to destroy even fragile ecosystems. Most governments enact environmental regulation to limit harm to ecosystems and impose fines for damage. Damages would be measured not by people’s loss of use of the ecosystem, but by the damage inflicted on the ecosystem itself. For "backward" developing countries by world economic standards, they are far ahead of us! Melbourne today was again declared the world's most "livable" city. But last night, the Victorian Upper House of Parliament passed a planning amendment to further extend Melbourne's Urban Growth Boundary (UGB) by 6,000 hectares following on from the previous government’s 40,000 hectares extension in 2010. The current government’s extra 6,000 hectares are endearingly called "logical inclusions". Well really, is up to the authors to call their brainchild "logical"? If Melbourne is the most livable city it is somewhat dispiriting to think of the cities that came 4th 5th and 6th! Melbourne is jammed with traffic; its trains are overcrowded – such that the “solution” is to remove seats. There is practically no public transport at all in the outer suburbs. Houses all through the established suburbs are demolished in random fashion to make way for higher density living and the urban landscape is becoming one of generic non- architecture with non- gardens taking over. Areas of nature on the urban fringe are continually swallowed up with housing, roads and associated commercial use with no respect or provision for wildlife. Expect more of the same – forever. We all know that the "Livability Index" is a tragic joke on the people of Melbourne, Sydney, Hong Kong and Vancouver, where it has often been applied. What do these cities have in common? Overbuilding, loss of democracy, high forced immigration and an English colonial background. In Melbourne property speculators have got themselves elected to parliament with the help of a media with commercial interests in development. That Australian state governments are now resorting routinely to using this arcane tool to promote developer interests over those of Australian citizens is sinister. It is hard to respect anyone who stoops to using it. This so-called 'livability index' report comes from the Economist Intelligence Unit (EIU), which is oxymoronic in itself and part of a group associated with the anglo-centric Economist magazine. People in Hong Kong rent cages stacked one on top of the other in rooms in concrete high rises. There are protests about the abrogation of public land and the ever increasing intensity of development. The EIU put overcrowded concrete Vancouver and Melbourne equal at the head of its list in 2002. Clearly this list is a list about concrete spaces and developers' anti-human values and the Economists silly promotion of economic growth and globalisation. The award is just a manufactured consensus thing promoted by big business for big business and against relocalisation, human scale and natural surroundings. That the Sydney Morning Herald publishes this nonsense is just another indication of the corruption of real reporting by corporate agendas. In other words this is all just corporate propaganda which little girls and little boys should be taught to dissect in primary school and once were. Wonder what has happened there? I adapted this comment from an earlier one here on July 9th, 2012.